PROFESSOR DUNCAN BRUCE graduated from the University of Liverpool (UK), where he also gained his PhD. In 1984, he took up a Temporary Lectureship in Inorganic Chemistry at the University of Sheffield and was awarded a Royal Society Warren Research Fellowship. He was then appointed Lecturer in Chemistry and was promoted Senior Lecturer in 1994, in which year he became co-director of the Sheffield Centre for Molecular Materials. In 1995, he was appointed Professor of Inorganic Chemistry at the University of Exeter. Following the closure of Exeter's chemistry department in 2005, Professor Bruce took up his present position as Professor of Materials Chemistry in York. He is currently Chair of the Royal Society of Chemistry Materials Chemistry Forum. His current research interests include liquid crystals and nanoparticle-doped, nanostructured, mesoporous silicates. His work has been recognized by various awards including the British Liquid Crystal Society's first Young Scientist prize and the RSC's Sir Edward Frankland Fellowship and Corday-Morgan Medal and Prize. He has held visiting positions in Australia, France, Japan and Italy. DR. RICHARD WALTON, who was also formerly based in the Department of Chemistry at the University of Exeter, now works in the Department of Chemistry at the University of Warwick. His research group works in the area of solid-state materials chemistry and has a number of projects focusing upon the synthesis, structural characterization and properties of inorganic materials. DERMOT O'HARE is Professor in the Chemistry Research Laboratory at the University of Oxford. is research group has a wide range of research interests. 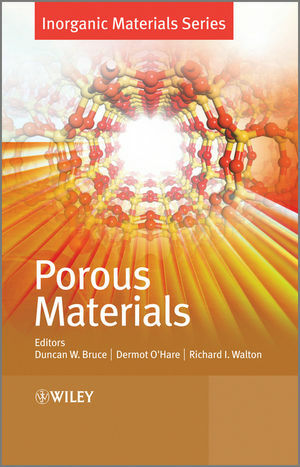 They all involve synthetic chemistry ranging from organometallic chemistry to the synthesis of new microporous solids. 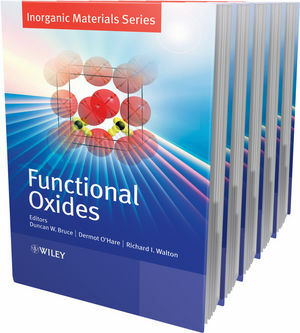 Duncan Bruce and Dermot O'Hare have edited several editions of Inorganic Materials published by John Wiley & Sons Ltd.
2010 Ludwig Mond Award Dermot O'Hare has received this award from the Royal Society of Chemistry. Click here to find out more. 2010 Tilden Prize Duncan Bruce has received this award from the Royal Society of Chemistry. Click here to find out more.